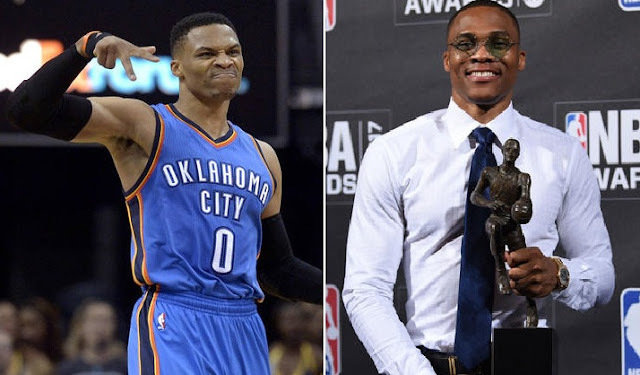 NBA – On June 26, 2017 (US TIME) the Oklahoma City Thunder point guard Russell Westbrook was named as the 2017 NBA Most Valuable Player in the first ever NBA Annual Awards held at Basketball City in New York. The event was hosted by the main host, musician “Drake” and NBA crew, Shaq, Ernie, Charles and Kenny. The 2017 NBA Awards was attended by several media personalities, NBA players from past to present, especially for those players that was nominated for a certain award, Coaches, players families and friends and with special performances of artist Nicki Minaj and 2 Chainz. Traditionally NBA Player who won a certain individual award at the end of a regular season is being rewarded during the 1st round of the post season and it is announced separately as the post seasons go by, unlike today where all candidates for the certain awards are in one event and in just one night all winners are all revealed. The most awaited and the most important award of the night belongs to Russell Westbrook as he became the 62nd NBA player to win the prestigious awards the 2017 NBA Most Valuable Player (MVP). He joined former teammates Kevin Durant as the only two players who won the MVP as Oklahoma City Thunder. Westbrook, who averaged a whooping triple doubles this season sets an NBA record for most triple double in a single season with 42, surpassing the half a decade records of Oscar Robertson of 41 triple doubles in 1961 – 1962 NBA Season. Westbrook beat former teammates and closed contender for the prestigious awards Houston Rockets, James Harden and San Antonio Spurs Kawhi Leonard. Russell Westbrook almost single handedly brought his team OKC in the 2017 Playoffs but only eliminated in the 1st round. Westbrook became the guy or the 1st options of the OKC after Kevin Durant decision of leaving the team and his best friend. However the decision of Durant leads to Russel Westbrook superhuman performance in every single game of the regular season that pays to his first ever MVP award. No Comment to " NBA Awards Named Russell Westbrook as the 2017 NBA MVP "